Since 1999, Frog’s Tooth Vineyards and Winery has been growing, crafting, pouring, and sharing our hand crafted small batch wines from the Sierra Foothills. What we don’t grow on our beautiful 10 acre vineyard in Copperopolis CA, we source from other local growers who share our passion. From our inviting tasting room and patio, a short walk from Main Street in Murphys, we have been pouring our wines since 2007. Our winemaker Will SavoieHoule has brought a new youthful passion to crafting delicious wines. Each and every varietal is painstakingly hand sorted to ensure only the best fruit makes it into our award winning wines. Will’s passion for bringing out the best that our fruit has to offer is contagious. We encourage you to come by our tasting room and enjoy a glass on our patio or join us for one of our club member parties at our Vineyard. Every sip of our wines is a true taste of the Sierra Foothills! 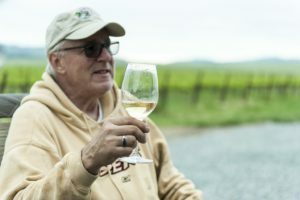 As a sales and marketing executive in the electronics production arena, Larry was drawn to wine early in a career that allowed travel from the East Coast to Silicon Valley. As a result of these frequent business trips to great wine regions and a marriage to a wine connoisseur (his wife Pamela), jumping head-first into the wine industry only made sense. In 2003 after long weekends wine tasting in the Sierra Foothills, Larry and Pamela decided to purchase a second home in Calaveras County. This purchase led to volunteering in a favorite winery in Murphys and subsequently a purchased share in a new vineyard…not yet a winery called Frog’s Tooth. Larry was given the name “The Enabler” as he submitted funds, secured partner/investors and financing for a startup winery. We were able to in short order: build out and open a tasting room in Murphys, design and construct a winery facility (with the help of his sons, wife, and partners), and begin to make award winning wines. We celebrated our 10th Anniversary of having a tasting room this summer of 2017. His drive and vision have allowed Frog’s Tooth to grow into the vibrant business it is now. With strong French roots on both sides of his family. natural wine artistry runs strong in his veins. Born in Calaveras County, the mountains have given him his livelihood. He was born to be a Winemaker. Will started doing vineyard work at the age of 19 out of a desire to learn the business. 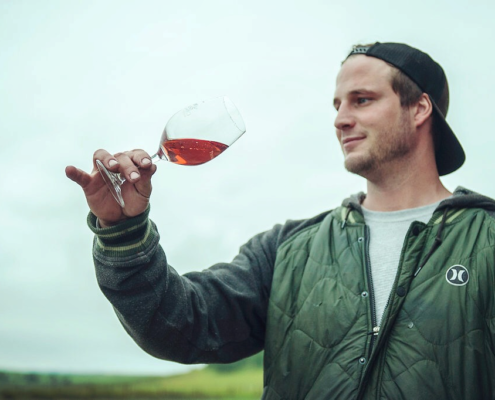 As an energetic thoughtful young man he caught the eye of long time Calaveras winemaker Nathan Vader. His determination and drive were hard to ignore and he quickly became assistant winemaker. Will honed his palate and at an early age, finding that practical experience rather than University training was more valuable. After spending 8 years in a labor of love he was sought out and became head winemaker of Frog’s Tooth Winery and Vineyards…quite an accomplishment at 26 years young. Will has spread his wings and is relentlessly showing bold creativity with Frogs Tooth Winery. Every wine gives a full experience and such a beautiful signature for your palate to interpret. Recently entering 8 wines at the SF Chronicle Competition and scoring 8 medals. Will’s Old World ancestors would be extremely proud.